While we’ve played some in cave, sometimes land your ship shoot em ups before – Lunar Lander being the obvious one – I have conincidentally picked this and Pixeljunk Shooter to be played closely together. Both are similar multidirectional shooters, flying through cave systems, released about 15 years apart. And of course, here there’s no fluid dynamics. Still, I’m going to need to spend a bit of time separating the two in my mind. 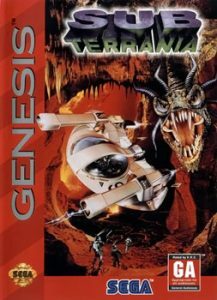 The truth is that I struggled more with Sub-Terrania. While the controls feel fairly standard, it relies heavily on your movement determining acceleration rather than velocity, which makes it difficult to control and brake to avoid running into the walls. And fuel is limited, so, well, the game might not be in the arcade, but it feels like it keeps that difficulty and doesn’t really agree with me. There’s some nasty placed challenges that don’t help with this. There are platforms that move back and forth when you hit them that can squash you, enemies in awkward places and other tricky sections. They just didn’t make for a fun challenge, it got frustrating instead, with the wins being small enough to not really matter. It does what it does, well enough, but not really worth it.